1. Always trust your hands - what I mean by this is kneading the dough with my kitchen aide dough hook did not do me any favors. kneading the dough by hand allows you to feel the "readiness" of the dough. I found the machine kneaded dough was a bit over worked and lacked the soft smooth dough which is achieved by kneading with your hands. 3. Baked yeasted donuts are best when eaten the day you make them - warm out of the oven they are amazing...a few days after not so much. 4. 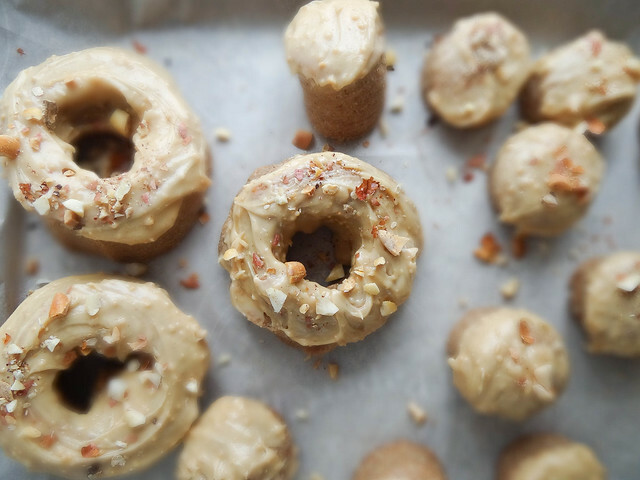 The glaze/frosting is super important - plain donuts are not for me , however give me a doughnut loaded a peanut butter sugar glaze/frosting and I am yours forever. In the end baking up yeasted baked donuts was worth it , they were light & airy with a hint of sweetness. I would totally make the dough the day prior to baking these up fresh the following morning for guests. Who wouldn't love a freshly baked doughnut first thing in the morning for breakfast or brunch; it just screams "you totally rock and are a master in the kitchen!" . What you see pictured here are two glazes; one made witch Dark Chocolate Peanut Butter and the other made with White Chocolate Peanut Butter; both are equally delish. Not a fan of frosted donuts? They rocked my socks off when I tossed a batch in sugar and cinnamon...so GOOD! 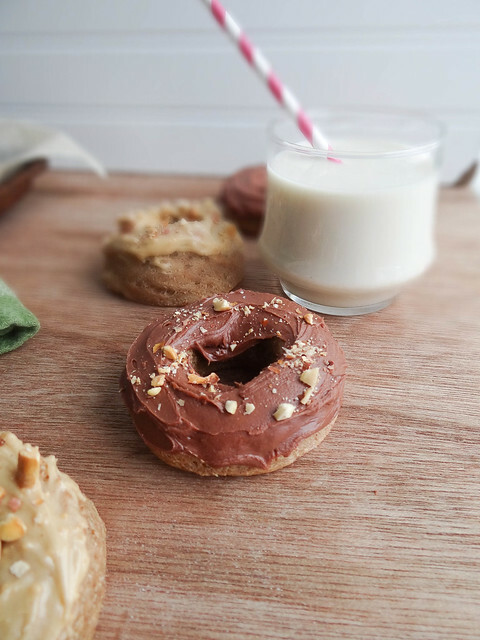 For a play on sweet and salty sprinkle some chopped peanuts over the top of each doughnut- I should also mention you have the added bonus of doughnut holes. So not only do you get a baker's dozen of big donuts but 13 pop-able doughnut holes which can be mighty dangerous if left unattended...way too easy to indulge in one too many of these little guys. So, feel free when you make these to box up a batch and deliver to your closest neighbor or co-worker. Warm the milk in a sauce pan or microwave until just warm- about 120*. Add to mixing bowl with the yeast - allow to sit for 5 minutes. Add the maple syrup, melted butter , peanut butter & 1 1/2 cups of flour, vanilla & cinnamon. Stir with a wooden spoon until a dough begins to form. Add an additional 1/2 cup or so of flour to create a more structured dough ball, dough should no longer cling to the side of the bowl but still be soft and pliable. Turn dough onto a lightly floured surface. 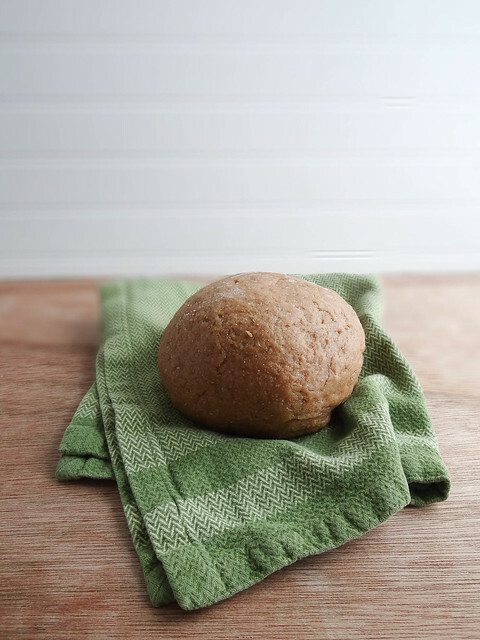 Working with a 1/4 cup at a time knead in remaining flour until a soft, smooth and elastic dough ball forms. Place dough in a greased bowl cover, allow to rise in a warm area for 1 hour or until doubled in size. Turn risen dough onto a lightly floured surface. Using a floured rolling pin, roll dough out into a 12 x 9 rectangle about a 1/2" thick. 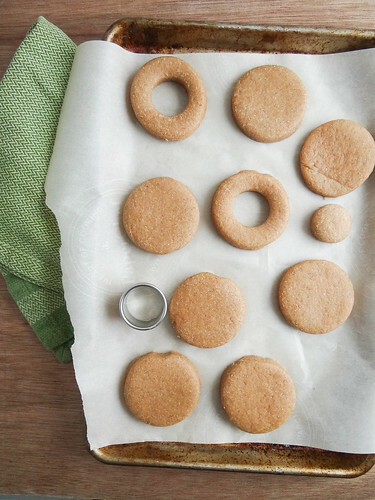 Using a doughnut cutter or 2 ring cutters (1 large ring + 1 small ring for center) cut out the large rounds and place on a parchment lined baking sheet. You will need to re knead and re roll the scraps to make all 13 donuts. Once all large donuts have been placed on your sheets, use the smaller round cutter to cut a smaller circle inside the larger circle- these are your doughnut holes. 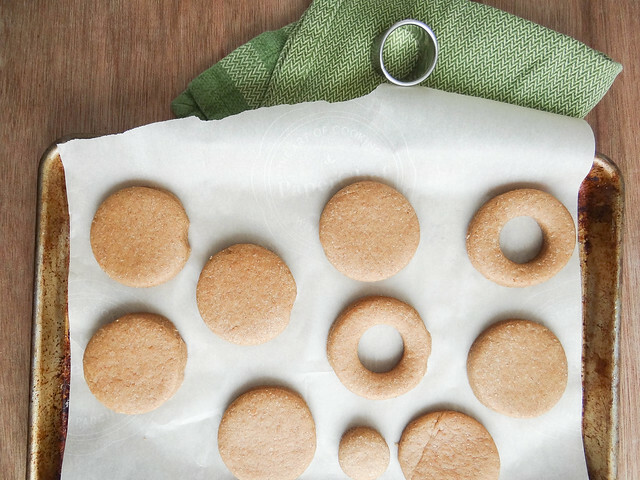 Place the smaller circles on a parchment lined pan. Pre heat the oven to 350*. 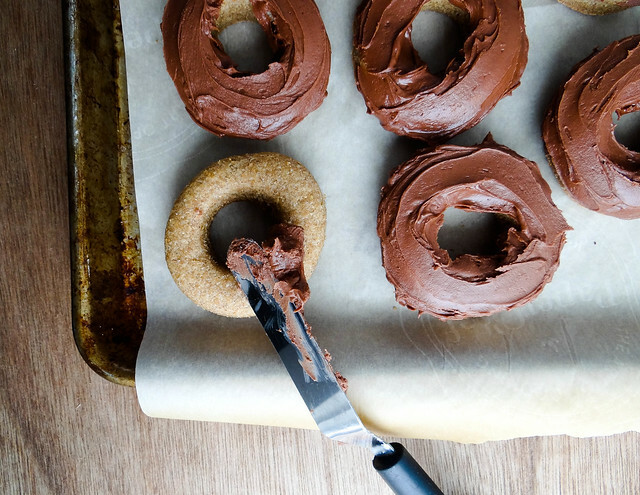 Cover the baking sheets and allow the donuts to rise for 30 minutes. Bake in the oven for 12-15 minutes or until donuts are golden brown on the bottoms. 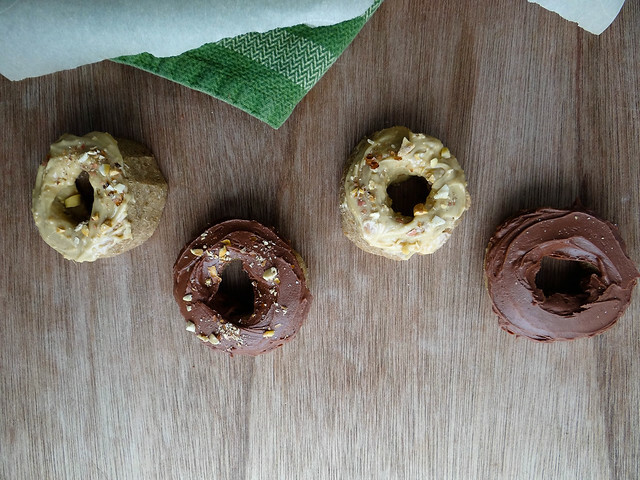 While donuts are cooling, make the glaze/ frosting. Divide the powdered sugar into two bowls (if making 2 frosting/glazes). Stir in peanut butter into each bowl and add enough milk to achieve the desired consistency. I used 1 1/2 tbsp for the chocolate and 2 tbsp for the white chocolate glaze. 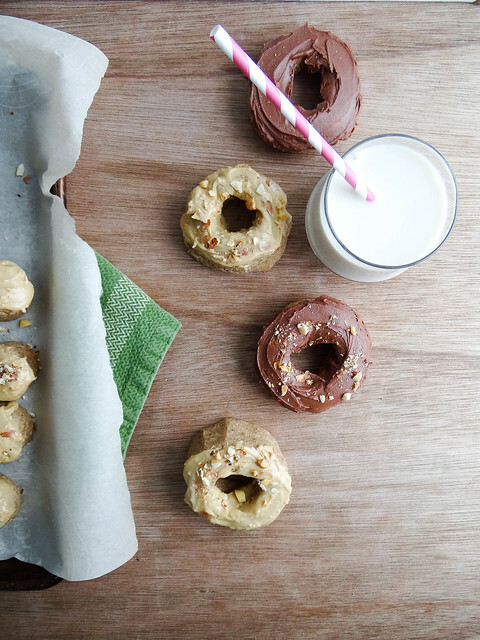 Frost or dip each doughnut and sprinkle with chopped peanuts. The donuts are best enjoyed the day they are made, however will keep for a few days after. The dough can also be made a day in advance. Simply store the dough in the fridge during the first rise, the continue the following morning with the cutting of the donuts & second rise. So delicious! And beautiful photographs! Thank you so much Kier for the lovely comment! good job, lady! i wouldn't have the patience for this endeavor, but you knocked it out of the park! these look delicious! Man, I wasn't sure if I was ever going to get this one right, I am so happy that I persisted! You make me wanna be a better baker. Well, a baker at all really :) These look so delicious, I could just scream! awesome! i love your work space.. so neat and clean:)) i'd probably whip up a batch for dessert! Holy delicious!! These donuts look perfect! They were pretty close to perfect, but I'd have to say your Birthday donuts were PERFECT! 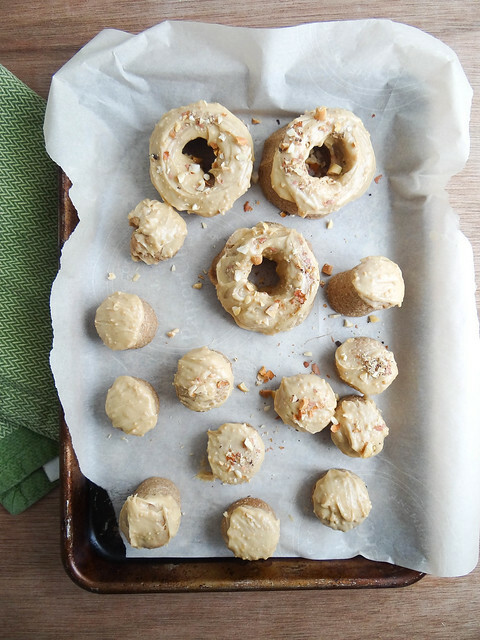 The frosting totally made these donuts, I would definitely use the frosting recipe over and over again!- Good luck on the GF ravioli- that must be so challenging, can't wait to see what you come up with! These sound like such a treat - lucky for whoever gets to enjoy them! 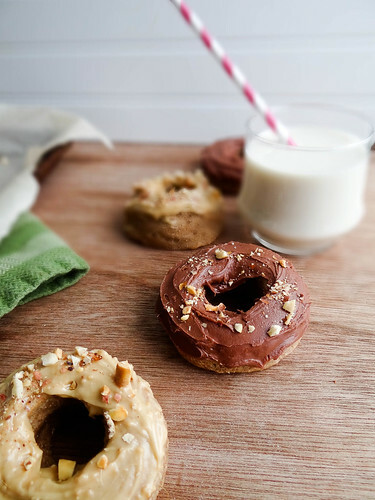 I like how the donuts themselves have some peanut butter in them so I'm sure they taste great on their own, but then the frosting makes them irresistable! Too bad they don't last longer...I got my sister a donut pan a while ago and she's rarely used it because she'd have to find people to eat up a batch of donuts right away! 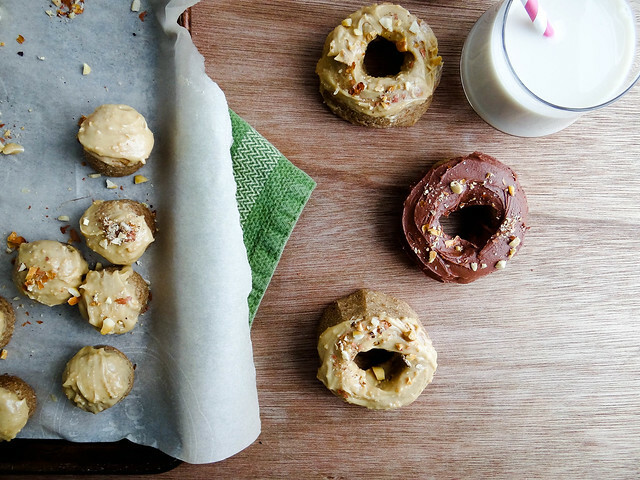 I love peanut butter and yeast doughnuts. I love that you can bake yeast doughnuts!